TBILISI, DFWatch — The Prosecutor’s Office on Monday is expected to charge the former head of Georgia’s domestic intelligence service in absentia. Data Akhalaia was head of the Constitutional Security Department (CSD), locally known as ‘Kudi’, and former Deputy Defense Minister. As the new government continues its prosecution of former officials, he is likely next in line, but has not been seen in Georgia since the election and his location remains unknown. Chief Prosecutor Archil Kbilashvili Friday said on local radio that there will be brought charges against Data Akhalaia. He said th eformer CSD chair is accused of abuse of powers. The testimony which forms the basis for the detention of twelve Interior Ministry officials , indicates that they were acting on his personal orders and with his participation. Specifically, part of the testimony deals with illegally obtained information. 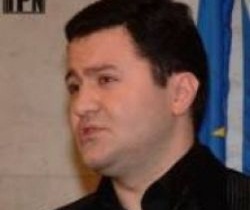 Archil Kbilashvili assumes that Data Akhalaia will be charged on Monday, despite his absence. The Prosecutor’s Office already published testimony which tells in detail about employees of the interior ministry illegally making secret recordings and gaining private information to use against opposition parties and against the Georgian Dream coalition, which is currently in government. Data Akhalaia is one of the main figures in this testimony. For years Data Akhalaia used to hold higher positions at the interior ministry. He was chair of the CSD, although this was kept secret until this year. For last months he was Deputy Defense Minister, but he left after National Movement was defeated in the parliamentary election. It is unknown where he left to. Data Akhalaia is brother of Bacho Akhalaia, former government official detained for abuse of powers, illegal deprivation of freedom and torture. He is currently in preliminary detention awaiting his next court appearance December 25. The Prosecutor’s Office claims that there are additional documentation and therefore they assume that his charges may become more severe. The Akhalaia family is known for its loyalty to President Mikheil Saakashvili. Father Roland Akhalaia used to hold an informal grip on the Samegrelo Region in the west bordering with the disputed Abkhazia territory. Currently he is a member of parliament for the National Movement Party, after defeating Irakli Alasania in the election.